From the bestselling author of Stitches and Help, Thanks, Wow comes her long-awaited collection of new and selected essays on hope, joy, and grace. Anne Lamott writes about faith, family, and community in essays that are both wise and irreverent. It's an approach that has become her trademark. 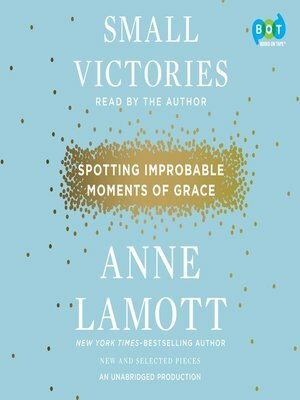 Now in Small Victories, Lamott offers a new message of hope that celebrates the triumph of light over the darkness in our lives. Our victories over hardship and pain may seem small, she writes, but they change us--our perceptions, our perspectives, and our lives. Lamott writes of forgiveness, restoration, and transformation, how we can turn toward love even in the most hopeless situations, how we find the joy in getting lost and our amazement in finally being found.